Brian Giandomenico 1st boy on left, Marcus Aavall 2nd boy on left, Ole Fischer 2nd from right. 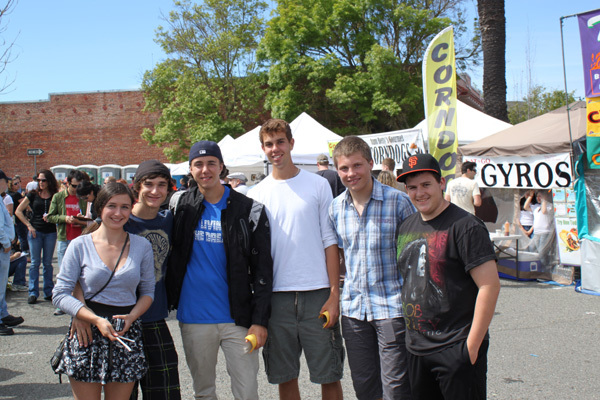 Three local exchange students that are living and attending high school in Petaluma came out to enjoy the local hometown parade. These students are sponsored to come to America through EF Foundation for Foreign Exchange. Casa Grande students are Brian Giandomenico from Switzerland and Ole Fischer from Germany. Marcus Aavall from Sweden is attending Petaluma High School. These students spend a full school year living with an American host family and attend the local schools, and look forward to learning the American way and becoming part of the local community. They were all impressed at the “Home town” feel and spirit of Petaluma and the surrounding communities and really enjoyed watching the Butter and Egg Parade. Brian, Ole, and Marcus are all sad to be leaving in June. We would like to thank our community for making these boys feel at home and hopefully they will come back one day to show their own family the community that they have been part of for this past year.